Who doesn’t love a good pork chop for dinner? They’re super easy and super delicious. They’re especially delicious with whiskied pears and thyme on top. Sweet, visit this site salty and pork-y. The pears and thyme add a nice taste of fall and the whiskey adds just the right amount of boozy flavor. It’s one of those get-home-late-and-throw-down-dinner-in-20-minutes kind of recipes. If you’re weirded out by combining fruit and pork products, prostate you shouldn’t be. Lots of barbecue sauces and glazes are sweet and fruit-based. It’s just plain good. Set a large skillet over medium-high heat. When it’s good and hot, begin heating the oil and season the pork chops with salt and pepper on both sides. Place chops in the skillet and cook them, undisturbed, for 2 minutes on each side. Remove the chops to a plate. Reduce the heat to medium-low, remove the skillet from the burner and add the chicken stock. Use a wooden spoon to deglaze, or scrape the nice browned bits from the bottom of the pan. Add the pears, thyme, lemon juice and whiskey and cook for about 5 minutes, or until the pears caramelize and become soft. Salt to taste (depends on your chicken stock). Remove the skillet from the heat and add the pork chops back in, flipping them so that they become coated in the sauce. 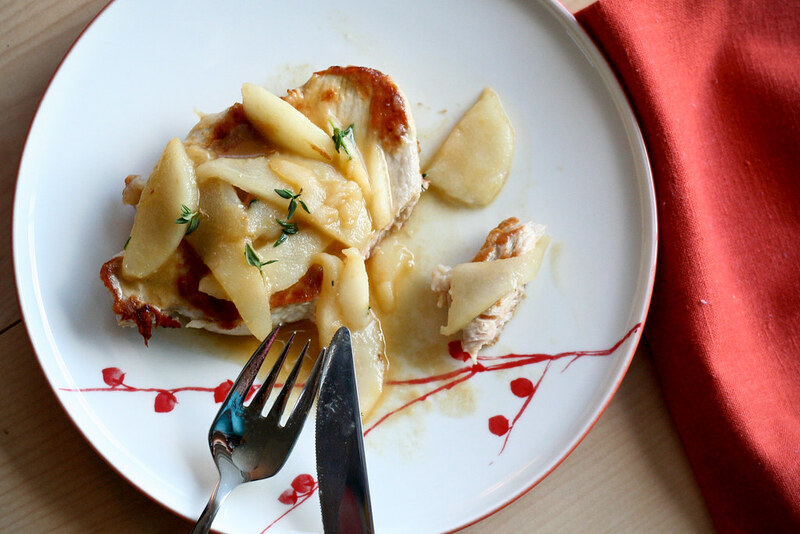 Serve each chop covered with a nice heap of pears and a drizzle of sauce from the pan. Sounds absolutely perfect for a fall night! Pork and fruit are delicious; as are booze and thyme! Thank you! I’ll admit, I have an aversion to pork chops (perhaps my mothers methodology of cooking is the reason) but THESE look fantastic and with a nice helping of that sauce. I may be a convert after this. My partner and I made this delicious dish last night. It was perfect. The whiskey came through and was a perfect partner with the pork and pears. I absolutely loved it. Do be careful with the salt though. Between the stock and salting the pork chops, I found ours a bit too salty and will reduce it next time. We had them with fingerling potatoes. You had me at pork chops. Then over the top at pears. Then like :O at thyme.